Home REAL ESTATE NEWS Guides and Reports Here’s why Ghana is being heralded as the next big tourist destination. Here’s why Ghana is being heralded as the next big tourist destination. 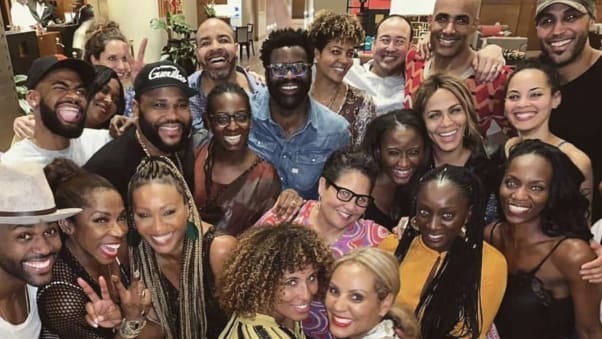 When some of the most well-known faces from the African diaspora arrived for a recent vacation in Accra, Ghana, it looked like just another gathering of famous people.Actors including Idris Elba rubbed shoulders with supermodel Naomi Campbell, TV sports presenter Mike Hill, and author Luvvie Ajayi. Behind this meet-up of box office stars, fashion royalty and top creatives is a focused and ambitious strategy to make Ghana a major tourist destination.The country recently unveiled a 15-year-long tourism plan that seeks to increase the annual number of tourists to Ghana from one million to eight million per year by 2027.Ghana’s travel industry is projected to raise $8.3 billion a year by 2027, plus associated benefits, according to the plan. The primary purpose of the festival was to forge closer ties between Ghana, the African continent and those of African descent living elsewhere.It’s 400 years since the first African slaves were taken from countries like Ghana to mainland America, marking the start of the trans-Atlantic slave trade route. This timing is based on the first recorded landing of a ship carrying Africans in Virginia in August 1619.An estimated 75% of slave dungeons on the west coast of Africa were in Ghana — millions of people were taken and transported on ships that departed from Ghanaian ports. President Akufo-Addo’s Year of Return announcement pointed to Ghana’s tragic legacy as a reason for diaspora descendants to return and learn about this chapter of history.The celebrities who attended the Full Circle Festival were taken on guided tours of the slave dungeons. “Every person of color needs to get on this pilgrimage,” said actor and co-organizer Boris Kodjoe who is of Ghanaian descent. “They need to experience this journey and get in touch with their emotional heritage, walk through the dungeons and see the ‘door of no return,'” he told CNN.Marketing rockstar Bozoma Saint John — who has a series of marketing coups like Beyonce’s halftime Super Bowl show under her belt — worked with Kodjoe, inviting 100 of the most influential members of the African diaspora to party with them at the festival over Christmas and New Year. 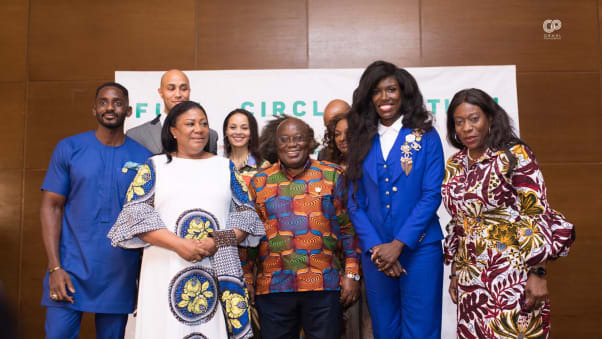 Ghanaian president Nana Akufo-Addo and wife Rebbeca pose with attendees at the Full Circle Festival.Ministry of Tourism, Arts & Culture of Ghana”I really felt that I wanted to show people the country I know and love. I take it as a personal mission and will use my professional weight to help the mission.”Saint John says that returning members of the diaspora can expect joy on their trip to Ghana as well as moments of solemnity. Skyscrapers and restaurants feature prominently in her promotional material. Attendees at the Full Circle Festival pose for a group photograph.Ministry of Tourism, Arts & Culture of Ghana”All the fun things you can do in Nice, Bali, Ibiza, you can do here in Ghana too,” she added. The celebrity-attended Full Circle Festival was the opening act of a broader Year of Return, announced by President Akufo-Addo in September 2018.Speaking about the year ahead at Washington’s National Press Club Akufo-Addo said Ghana would open its “arms even wider to welcome home our brothers and sisters in what will become a birthright journey home for the global African family.”The Year of Return includes a music festival, an investment conference targeting diaspora Ghanaians, and the Right to Return initiative, encouraging African-Americans to seek citizenship in Ghana. This year-long initiative builds on a long tradition of looking outwards.Ghana, the first sub-Saharan African country to win independence from colonial rule, has a history of pursuing ties with Africans overseas. It dates back to the country’s first President Kwame Nkrumah, whose vision of pan-Africanism included alliances with diaspora communities.Nkrumah enjoyed warm relations with African-American icons such as Muhammad Ali and Malcolm X, who both traveled to Ghana to meet him. Writer Maya Angelou spent time in the country after its independence and civil rights leader W.E.B. Du Bois is buried in Accra. Ghana has also sought to incentivize diaspora returnees through legislation such as the Right of Abode law of 2000 that allows people of African descent to apply for the right to stay in the country indefinitely.It was followed by the Joseph Project in 2007 that encouraged Africans in the diaspora to return, officials have compared it to Israel’s Law of Return that allows Jews to become citizens.